Exhibition Stands, Exhibition Stands UK, Exhibition Services | 200m2 | Interactive Exhibition Displays! Here on the 200m2 blog, we’ve spoken about the importance of the ‘exhibition experience‘ before. Interactive exhibition displays can be a great way of enticing people on to your stand. Interactive exhibition displays create dialogue and open up discussions in an informal environment. When combined with competitions, they can also be a potent data gathering vehicle. Evonik are leaders in the field of interactive exhibition displays. At the 69th STLE Annual Exhibition in Florida (18 to May), Evonik’s Oil Additives team will feature an interactive simulation which is designed to demonstrate the power saving opportunities of using specialist hydraulic fluids. Evonik’s ‘simulator’ will allow visitors to feel the power of hydraulic fluid formulated with Evonik’s DYNAVIS technology. 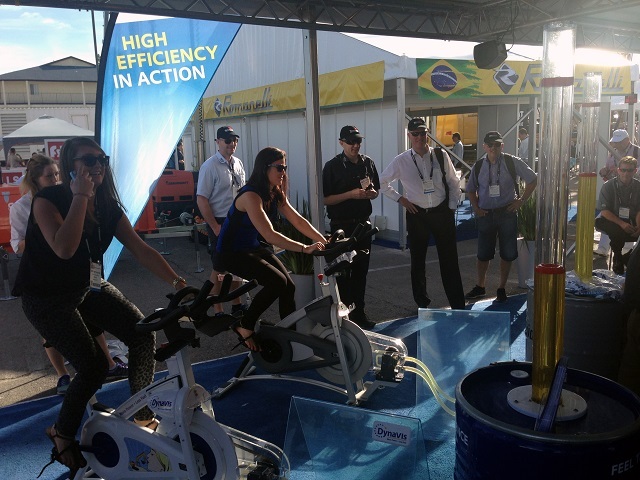 The simulator consists of two floor-mounted bicycles, each equipped with a pedal-operated pump to enable each bicyclist to push a column of oil to the top of a clear acrylic cylinder. One column is filled with DYNAVIS formulated hydraulic fluid and the other is filled with an ISO-46 monograde fluid. The two cyclists compete to push their column of fluid to the top first. The DYNAVIS formulated hydraulic fluid easily pumps to the top, while the monograde fluid requires much more effort! With the simulation, each cyclist physically experiences the advantages and disadvantages of each respective hydraulic fluid when hydraulic excavation equipment is pushed to its maximum capabilities. Visitors to Evonik’s Oil Additives display will also be invited to test their driving skills on the “Let it flow” Speedway where players can boost their efficiency with Evonik’s products. Winners of the racing game are entered in a daily drawing to win a Fitbit, the wristband monitor that enables tracking of fitness day and night. As a Titanium Plus sponsor of the STLE show, Evonik will also host the ‘Appreciation Hour Raffle’ on Monday, May the 19th. During this time, all STLE show attendees can visit the Evonik stand for a chance to win one of three Nike+ FuelBands. This will have a significant impact on the visitor numbers to the Evonik stand, increasing awareness of Evonik’s products across the entire show’s audience. So the next time you are thinking about your next exhibition stand, think about creating an interactive element. We’ve developed all sorts of concepts for clients over the years. Why not give us a call on 020 333 200 92 to find out more? Previous Previous post: Free exhibition stands at Devon Business Expo! Next Next post: Interactive exhibition stands for Ford!